Not talking about the popular '90s Empty-Vee dance program. And not talking about the grim but effective series of business articles exposing bad practices and the shortcomings of globalization over at Slate magazine, either. Not talking about the day gig. Not talking about a coffee house (or a coffee company, for that matter). I'm talking about powering through a writing project in its final throes. Call it what you will: the slog. The muddle. I call it "the grind." I'm in the midst of something like that now. I've been working on it off and on over the last year. 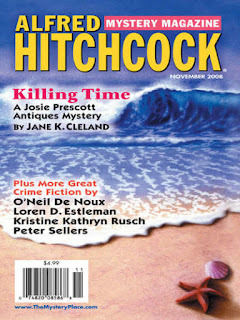 The idea is to expand a short story I sold several years back to Alfred Hitchcock's Mystery Magazine into a novella. Vegas, and involves the travails undergone by a mob fixer who gets caught up in a murder that may involve in his boss' brother: a guy he's been playing nursemaid to for a while, now. When the story dropped, friend after friend told me the same thing: that they wanted more. That they thought I had the makings of an actual novel here. So I thought, "Hey, what if I expand it to novella length, and put it out there and see what happens? How hard can it be, right?" As it turns out: pretty damned hard! The thing about writing a short story, or a novella, or even a novel, is that most authors (myself included), start out with a relatively clear idea about what they want to do. Whether you're a plotter or a pantser (I started out as the latter but am now firmly in the former camp), you have at least a rough idea of your potential beginning, middle and end. I was not prepared for how utterly down the rabbit hole the attempt to expand my original short story by an additional 10,000 words would take me. It turns out trying to expand an existing story into something longer entailed changing it up as much as it did expanding it. It meant that the initially lean style and terse descriptions had to be given room to work and breathe. It meant that conventions that suited my short story style had to be adapted and reworked, because what works well for 6,500 words, character/description/plot-wise, tends to look pretty thin, pretty stock and pretty flat over the course of 16,000 words. Plus, as I've mentioned before here and elsewhere, I've a challenging day job, a terrific marriage and a lively five year-old, all of which require a lot of my time and attention. That said, I did it. Finished it tonight. And on that note, I'm off to celebrate. See below for the banner ad teasing the cover artwork. You are talking to me, Brian. It's 3:33 a.m. and I'm at my computer in the middle of a grind. A few months back, I decided to expand an unpublished 16,000 word short story into a novel. I'm at 31,000 words now and the original story is barely there anymore. I'm grinding along and surprised the novel is much better than envisioned, but the grind continues. Good luck with yours. Some stories seem to expand well and some don't, and I can't explain why, but if anyone can do it right, it's you guys. Several years ago, I had a 6800-word story I'd run out of places to send for rejections. Then someone told me about the Black Orchid Novella Award and I added 9000 words to the story in some ridiculous amount of time. I say a week, and that sounds insane, but I think it's true. In any case, that story had a huge cast, and spreading it out meant I could introduce them more gradually. Brian, your observation that some conventions in a short story need to change for a novel is dead-on. Maybe that's why I admire Hemingway as a pioneer writer of short stories but have trouble getting through his novels. They feel too spare. While I'm here, congratulations to O'Neil on his being named a finalist for the Shamus Award. Interesting post, Brian. About a year ago, I wrote a post about expanding a short story into a novel and then cutting it back to a novella (One Shot). I was pleased by the result but surprised by how much time and work it took. I can relate to this. I've done it myself. Years ago, my mentor told me I was wasting perfectly good novel plots on short stories. Today, I see what he meant. But expanding a short story usually means taking the kernel of it and adding additional plot points (crisis points.) A short story that had an inciting moment and a climax, now has an inciting moment, and three crisis points (three act structure.) Interesting post! The Grind short-circuited my mental process recalling way pre-90s when girls in Harlem taught their version to me. Great post, Brian. Congrats on the new novella! Leigh, Dale Andrews is a good guy to work with, on those plots! Glad my post resonated with you,O'Neil. I'm tickled that I got a comment from a fellow Sleuthsayer who also not only published in the issue of AHMM in which I published "Suicide Blonde," but who actually got his name on the cover! Hang in there on the grind. We all know there is only one solution, and it sure as hell ain't giving up. Steve, I'm right there with you on Hemingway. "Hills Like White Elephants," "Cat in the Rain" and "The Snows of Kilimanjaro" are magnificent achievements. "Across the River and Into the Trees," less so. Isn't it interesting that in his short stories, Hemingway the ultimate male chauvinist misogynist develops his female characters far more than he seems to have managed in any of his books? B.K. and Melodie, thanks for your comments, and for your insight into the process. I had not worked out the process quite that way in my head (or given much thought to the process at all, hence taking nearly a year to get it right! ), so I am grateful for the structural words(e.g. "crisis points") that I can add to my vocabulary (I'm a three-act/Save the Cat/James Scott Bell/Christopher Vogler devotee, myself). Leigh, I bet those Harlem girls were *something else*!